Swimming pools enable a timeless form of enjoyment. But the business of constructing them is a thoroughly modern one, with advances in technology consistently providing new possibilities. The biggest recent development is the incorporation of remote automation — tools that allow users to control a pool’s environment from anywhere in the world. With systems like the popular iAquaLink from Zodiac Pool Products, an app enables control of water temperature, cleaning equipment, lighting, spa jets, and poolside elements such as fire features and entertainment systems. Two new technologies that are transforming pool maintenance are UV water purification and ozone oxidation. These systems can be used separately but are better paired, since the UV water purification system cleans out bacteria, while the ozone system kills micro-organism and destroys inorganic materials. UV water purification uses a germicidal frequency of UV light to disrupt the DNA of microorganisms and prevent them from reproducing. The pool’s water cycles through a canister-like contraption that zaps it with a UV beam as it passes, a completely chemical-free method of ensuring high water quality. Ozone is a more powerful disinfectant than chlorine; it can destroy some chlorine-resistant pathogens and micro-organisms, as well as inorganic materials like suntan lotion and cosmetics. With ozone oxidation, energy breaks apart oxygen molecules into single oxygen atoms, which then form a weak bond with free oxygen molecules, creating ozone. The bond is broken by contaminants, which the freed-up oxygen atoms destroy, leaving only oxygen behind as a byproduct. This process not only kills pathogens but also increases the degeneration of organic matter and increases the oxygen in the water without any added chemicals. Custom-designed in-floor cleaning systems also use technology to help ease maintenance. Currents generated by small jets embedded in the pool’s bottom and sides push debris into a drain that feeds it into a collection canister. Pool owners can remove a large portion of debris from the pool simply by emptying the canister, cutting down more laborious methods of cleaning. “We want to make sure our clients have more time to enjoy their pools instead of spending a lot of time cleaning it themselves,” says Woods. Pool lighting has also been modernizing in recent years. Using LED lighting both inside and around the pool is an ongoing and ever-increasing trend, as they are a lot brighter, smaller, and come with more color options than traditional incandescent lighting. LED lights can be used to create dramatic affects, especially in pools with stonework and waterfalls, and can even be synchronized to music. They can be placed strategically inside the pool to highlight its shape or the outline an in-pool spa. As with other electronic features of pool design, lights can be controlled remotely through automated systems. 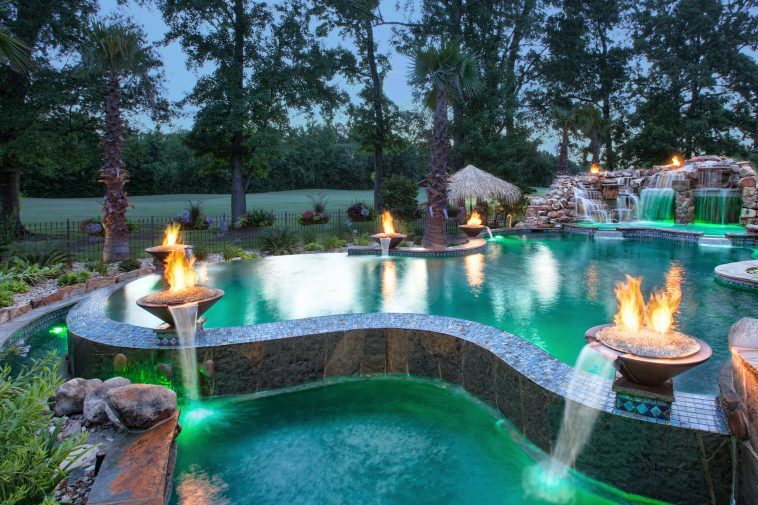 Other longstanding technological features that are increasing in popularity among pool builders are fire features and audiovisual hookups. Fire features go beyond the typical tiki torches and fire pits — natural-gas fire bowls and fire pots are increasing in popularity and are often incorporated into designs that give a modern and refined look to the poolside area. More and more poolscapes also feature televisions and sound systems, creating a sense of luxury and leisure. Like lighting, fire and audiovisual features can be automated and controlled remotely. 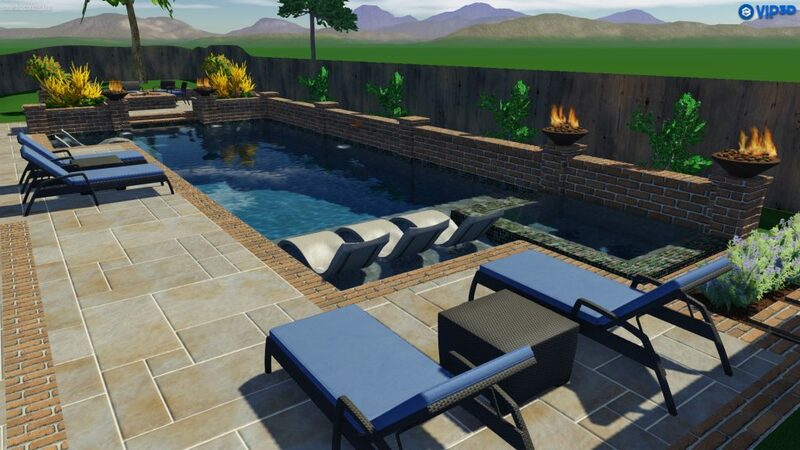 The process of designing and building pools is also advancing. Computer programs like Pool Studio allow designers to create and customize pool concepts with ease and accuracy. They can present their clients with 3D renderings of proposed designs, including virtual “flyover” videos that showcase a full poolscape concept. The ability to convey the full-surround effect of a design to a client is changing the swimming pool industry, bringing clients into closer collaboration with designers and unleashing designers’ creativity and vision. Like design processes, pool construction techniques continue to evolve. Morehead Pools’ method of curing concrete by soaking it in water is not typical but is becoming more popular. Keeping the concrete damp prevents it from hardening too fast or cracking, resulting in stronger concrete. New technologies and methods are transforming every aspect of the swimming pool industry. Owners find it easier to control and maintain their pools, while designers and builders are enabled to create functional and attractive poolscapes. Meanwhile, swimming is just as fun as it has always been. For additional resources, visit www.masterpoolsguild.com.